Last week Springmont's Middle School students participated in internships. While 7th-year students worked in classrooms and administrative offices on campus, 8th-year students ventured out into the wider community. Thierry was an intern in Rosanne's Primary class. On his second day he reflected, “I’m not sure how I feel about this internship. Yesterday I thought it was just a lot of fun, but today, I’m seeing the work that goes into it and how the students respond to different requests.” Other 7th-years spent three days helping in the Art Studio, Outdoor Science Education, the Admission and Development Offices, and other Primary classrooms. 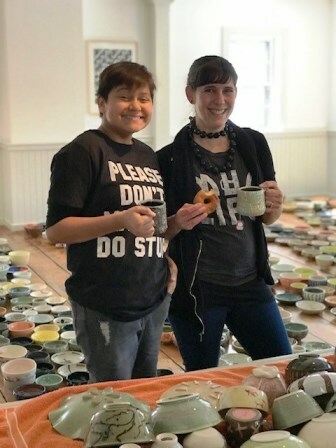 8th-year Emma Rose traveled to New York to the Women’s Studio Workshop in Rosendale. On her second day, she said, “It’s really fun. I’m working in clay mainly, but I might do something else.” Nico was enthusiastic about his time at Precision Jet/MicroDynamics where he helped design an illuminator for an interferometer, an optical device used in microscopes to measure minute changes in distance. Riley who spent three days at Orbit Arts Academy, a provider of theatre art education, said, “My internship is GREAT.” Other 8th-year students interned at the Georgia State Capitol, the Fulton County Public Defender's Office, The Peach Pit gymnastics studio, two veterinary offices, and in accounting and financial consulting offices. Internships are not only a highlight of Springmont's Middle School experience but also a chance to see the challenges and thrills of real-world work and to explore potential career paths. Springmont's graduates end up knowing more about themselves and the world than their peers, enabling them to confidently take advantage of all the opportunities available in high school and beyond. Look for more internship pictures and stories on Facebook this week!